Jagdish Singh, Trivedi Global Inc. The aim of this study was to examine the potential of Consciousness Energy Healing based vitamin D3 and DMEM medium on bone health parameters. The test items (viz. vitamin D3 and DMEM), were divided into two parts. One part of each test item was received the Biofield Treatment by Jagdish Singh and those samples were labeled as Biofield Treated (BT) samples, while other parts of each sample were denoted as Untreated Test Items (UT). The test samples were found as safe in tested concentrations by MTT assay. ALP was significantly increased by 130.51%, 84.39%, and 67.51% in UT-DMEM + BT-Test item, BT-DMEM + UT-Test item, and BT-DMEM + BT-Test item, respectively at 1 µg/mL than UT-DMEM + UT-Test item group. Moreover, level of collagen was also significantly enhanced by 117.37% in BT-DMEM + UT-Test item at 100 µg/mL than untreated. Other parameter like collagen was significantly increased by 171.30%, 168.51%, and 110.48% in UT-DMEM + BT-Test item, BT-DMEM + UT-Test item, and BT-DMEM + BT-Test item groups, respectively at 50 µg/mL as compared to untreated. Additionally, level of collagen also elevated by 88.49%, 280.08%, and 63.28% in UT-DMEM + BT-Test item, BT-DMEM + UT-Test item, and BT-DMEM + BT-Test item groups, respectively, at 100 µg/mL compared to untreated. Besides, percent of bone mineralization was distinctly increased by 79.34%, 146.74%, and 162.76% in UT-DMEM + BT-Test item, BT-DMEM + UT-Test item, and BT-DMEM + BT-Test item groups, respectively at 100µg/mL compared to untreated. Overall, Biofield Treated vitamin D3 was significantly improved the bone health parameters and it could be a powerful alternative nutraceutical supplement to combat vitamin D3 deficiency and fight against various bone related problems including rickets, osteomalacia, osteoporosis, osteogenesis imperfect, bone fractures, osteoma, chondrodystrophia fetalis, stress management and prevention, autoimmune and inflammatory diseases, and anti-aging by improving overall health. Singh J, Trivedi MK, Branton A, Trivedi D, Nayak G, et al. 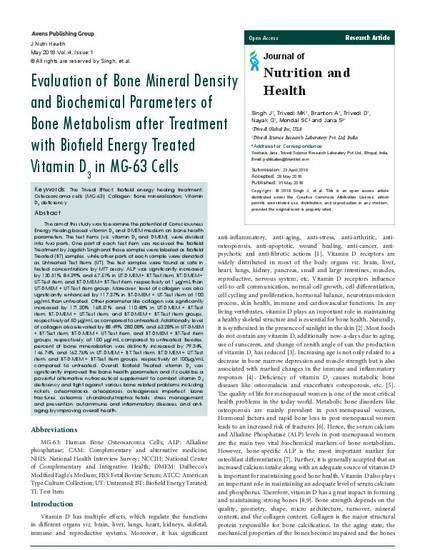 Evaluation of Bone Mineral Density and Biochemical Parameters of Bone Metabolism after Treatment with Biofield Energy Treated Vitamin D3 in MG-63 Cells. J Nutri Health. 2018;4(1): 6.